There are two major fly fishing events held each summer in Louisiana. One is the Contraband Fly Fishing Expo, held two weeks ago in Westlake. Hosted by the Contraband Fly Fishers, this year's event was very well organized and a big success! Folks are still talking about it. The second major event of the summer is the annual "Masters Series" held at the Red River National Wildlife Refuge in Bossier City. Hosted by the North Louisiana Fly Fishers of Shreveport, the Series is much different than the conclaves (expos) put on by other clubs. It's basically a day-long seminar conducted by the headliner. Segments include programs, a casting demonstration, fly tying demonstration, and more. The headliner is usually one of the big names in fly fishing, one who has made major contributions to our sport, and/or brings a wealth of information for improving our success as anglers. Past headliners have included: Dave Whitlock, Davy Wotton, Bob Clouser, and George Daniel. This year NLFF is proud to present Kelly Galloup. Galloup is co-owner and guide of Slide Inn Lodge on Montana's Madison River. Galloup started tying flies at age 13, he currently has over 40 recognized patterns. His biggest contributions have been the articulated streamers now recognized as the ticket to big predatory fish. In addition, Kelly has written two books, Modern Streamers for Trophy Trout and Cripples and Spinners. 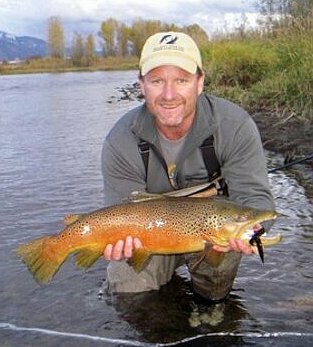 He's been published in nearly every fly fishing periodical in the country, and was a host of Fly Fish TV on the Outdoor Life Network. The Masters Series is a limited ticket event, with only 75 tickets sold. Tickets are $40 each and include lunch and refreshments. As of today, only a handful of tickets are still available. Anyone wishing to get in, please contact Scott Irwin at 318-469-0854 asap.